Shop at Harris Teeter and use your VIC card. 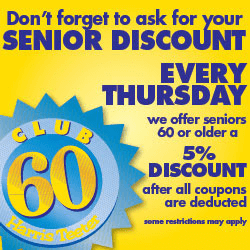 Every Thursday, if you are 60 or over, you will receive a 5% discount! If you qualify for this discount, don't forget to tell your cashier! Discount applies to all purchases except the following: Fuel, Pharmacy, Tickets and Gift Cards. In addition, it applies after all coupons and VIC discounts are deducted.